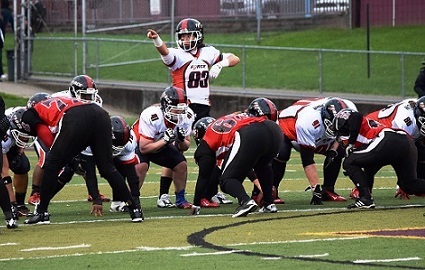 MUNHALL, PA: The past three seasons the Chicago Force and Boston Militia have met in the conference championship, with the Force winning the past two years. This first-ever regular season game between the two most dominant teams in women's football was the most anticipated contest of the season. 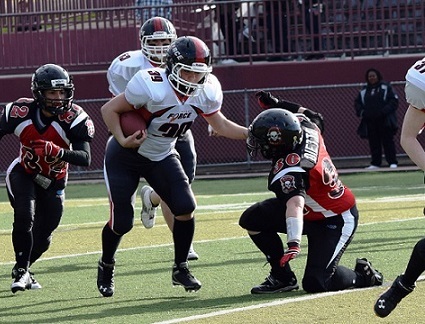 But injuries changed the face of this game as the Force were without their superstar quarterback Sami Grisafe and Boston did not have their leading running back Whitney Zelee. Both players suffered injuries earlier in the season but are expected to return for playoffs. Chicago's first play from scrimmage went for 18 yards, but on the ensuing play Darcy Leslie fumbled and the Militia recovered. Boston scored several plays later and converted on the extra point kick to go up 7-0. Chicago failed to move the chains on their ensuing possession and Paula Lehtinen's 53 yard punt backed Boston up to their own 6 yard line. Force linebacker Jen Dulski then sacked Militia QB Alison Cahill in the end zone for a safety to narrow Boston's lead to 7-2. But the Force were their own worst enemy, as they had five turnovers on the day, ending several promising drives. Boston would score three more times in the first half - two drives were extended by penalty calls and one score came after an interception. Chicago would score once more on a 10 yard carry by Kelsey Casey midway through the second quarter. At halftime Boston led 28-10, although many in attendance were unsure because the scoreboard and clock were not functioning for the entire game, which led to much chaos on the field. Chicago scored again in the second half on a 17 yard run by Jeanette Gray. The Force clearly found it difficult to fill the void left by Grisafe, as five different Force players lined up at QB in an effort to spark the offense. The most successful was Gray who completed six of nine passes for 83 yards. The Force have been decimated by injuries this season, with fourteen players on injured reserve, most of them starters. The Force, however, still have much talent and have responded to the adversity by finding new ways to compete. Rookie Casey began the season as the starting right tackle. She is now the primary running back and led the offense against Boston with 139 yards on 24 carries and a rushing touchdown. This was the first regular season loss for Chicago since the 2010 season, dropping their 2014 record to 5-1. The Force has already won their division and with it a bye for the first round of playoffs and hosting rights for the second round. Head Coach John Konecki is pleased that some of the younger players on the team - such as Casey and rookie Amber Kimbrough - are becoming primary contributors to the team's success. The next Force home game on Saturday June 7th against the Columbus Comets is Alumni Day and will feature a halftime acknowledgment of former players, as well as a player induction into the Chicago Force Player Hall of Fame. Game time is 5pm at Evanston Township High School. For tickets and more information please visit chicagoforcefootball.com or call Sam Powell / Game Day Operations at 312-371-7813.